With the mighty Rooks making their longest league trip of the season to deepest Suffolk at Leiston, I volunteered to go and retrieve the youngest Fuller’s from my in-laws in Newark. This annual ritual normally involves having to re-educate them on certain aspects of every day life, such as how to use electricity, eat with a knife and fork and not to douse every food item with gravy. It also gave me the opportunity to enjoy a night out in Lincoln, with £1.99 pints a norm, with The Current Mrs Fuller and a football away day on the Saturday. But where to go? Northern Steve had to work so I would be flying solo. I ruled out a visit to North Ferriby United in protest to their owners, laughed at the amount Notts County wanted to watch a League Two game (and the fact that their ticketing website was down) and had been to the likes of Grimsby Town, Boston United and Alfreton before. 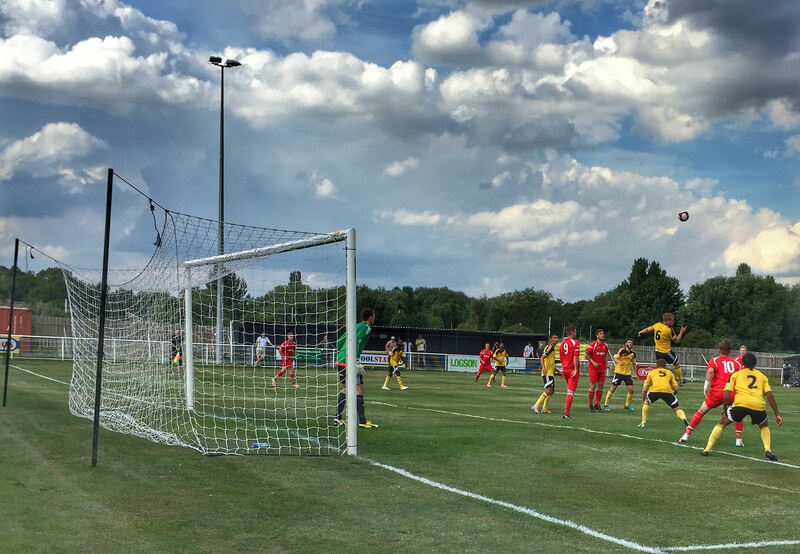 One new name caught my eye – Basford United down in the Evostik League Division One South. Promoted to the league at the end of last season as Midland League Champions, the club are probably best known for featuring not one, but two Hendries, Stuart and Lee. Yep, that Lee. The 38-year-old former England international is still on the books at the Mill Ground along with his younger brother Stuart. Just one line below on the list of fixtures was Carlton Town v Leek Town. Carlton was at 4 O’Clock on the map of Nottingham, essentially on the right side for my trip back up the A46. Google Maps said that with a fair wind, no Sunday drivers and a run of green traffic lights I could get between the two grounds in 16 minutes…or a half-time break. Would be rude not to do a Souness (“One half and he’s off) and cover two games. First stop – north Nottingham and the home of the Shipstones Beer, back in the suburbs after a twenty year holiday in Burton-on-Trent. 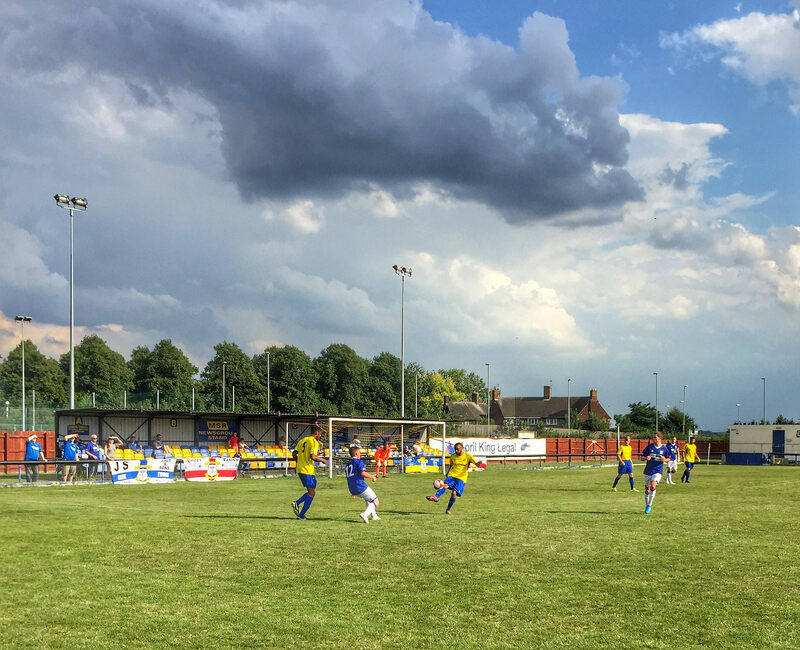 Basford United 1 Stocksbridge Park Steels 2 – The Mill Ground – Saturday 22nd August 2015 With the sun shining, there can be few better ways of spending a Saturday afternoon than watching Non-League football. 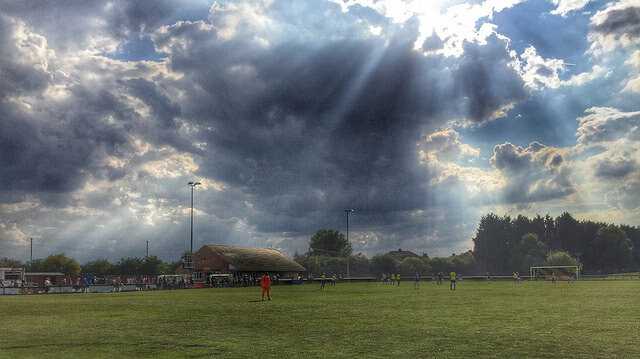 From the moment I arrived at The Mill Ground you could sense that this was a club who were starting to make their move up the Non-League pyramid. Smiles all round as you enter, buy a beer, order a sausage cob (had to use my local dialect look-up app for that). Whilst it was only game 3 of the season, the visitors arrived from Sheffield with a 100% record. However, it was the home side who did all of the early running, having an early goal disallowed for offside and commanding the midfield, thanks to the impressive Jermaine Hollis. They got their reward just before half time when Rob McCormick scored on his debut. 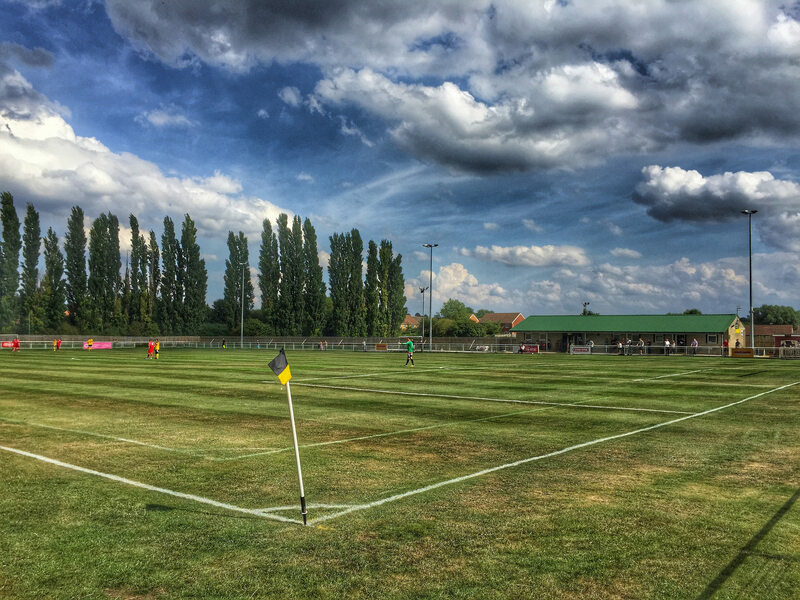 The second half report comes courtesy of Basford United’s website as I headed off to Carlton. “Basford again started well in the second half and had chances to extend their lead but as the game wore on, Stocksbridge began to find their feet and they equalised through sub Richard Patterson on 69 minutes. Five minutes later United were awarded the perfect opportunity to go back in front but substitute Stuart Hendrie’s penalty was saved by substitute keeper David Reay. Both sides then continued to push for a winner but it was the visitors who then snatched all three points in the first minute of stoppage time, as Hinchcliffe’s 30 yard thunderbolt crashed off the underside of the crossbar and into the Basford net.” Carlton Town 1 Leek Town 3 – Stoke Lane – Saturday 22nd August 2015 If you plan to visit Carlton Town in the future and use Google Maps, don’t. Because it will direct you to Stoke Lane but the wrong side of possibly the most ludicrous 10 metre section of road known to man. Outside the entrance to the ground is a small stretch of road that is a bus only route, meaning if you are coming from any direction bar the A612 you will need to go on a 3 mile diversion just for a 3 second journey. I’m sure some local counsellor is feeling very pleased with himself about putting that in place. Anyway, due to the unforeseen diversion, my arrival at Stoke Lane meant I had missed the first few minutes of the second half. Once again, I rely on the official match report to fill in the first 47 minutes:- “Carlton came out of the blocks fighting as Leek struggled to get into the game. With Daniel Gordon setting the tone, as he ran into space and delivered a shot that was just wide of the post. Then the away side were struggling to get the ball away, but the best the Millers could offer came from Nangle, as he dragged his shot wide of the target. Josh Rae was then the latest player to cause a threat, as his cross seemed to be destined to meet Daniel Fletcher, but Chris Martin was able to parry the shot just before the striker got there. Then a few moments later Fletcher had a second chance from a Tom McConway corner, but his header went out of play for a goal kick. Then finally the hosts broke the deadlock, as an error of judgment from Martin ended up with the ball at Nangle’s feet, who turned Dan Shelley as he cut inside, to then launch a shot onto the left boot that Martin could only get a hand to, before the ball rippled the net. However, the lead wasn’t to last long, as Tim Grice managed to find himself through one-on-one, after a pass from midfield. With the striker taking the ball round Curtis McDonald, before gathering his composure, and slotting it into the bottom corner. Before the break, Carlton had another chance to take the lead, as again, Martin played the ball straight to Nangle, but this time his effort, on his right foot was just over the crossbar.” The bright blue skies were slowly being eaten up by dark, grey thunderous clouds. On the pitch Leek Town looked the stronger of the two sides, controlling the midfield and constantly looking at a ball over the top of the back four. Grice was the main threat and he didn’t hesitate when presented with a one-on-one chance, as Conor Green was unable to deal with his header, and the striker didn’t wait for McDonald to come out, instead just smashing the ball into the back of the net. Grice completed his hatrick with a fine solo effort when it appeared that the opportunity had gone with ten minutes left. As the final whistle blew, the seventy or so fans made a hasty retreat before the rain fell. It had been an interesting afternoon, getting another couple of perspectives on how other’s approach Non-League match experiences. For both home side, the start to the season hadn’t been ideal. However, nothing is decided in August.